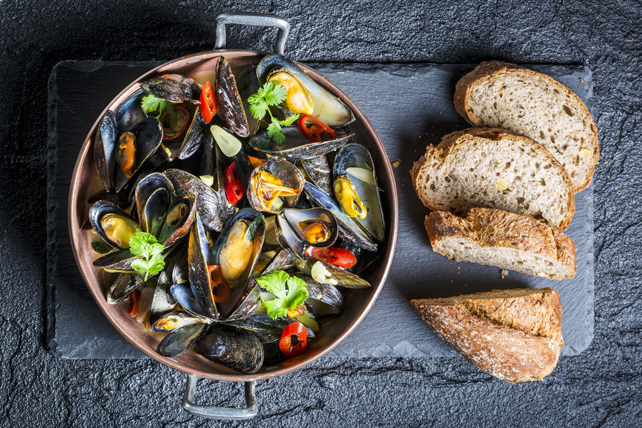 If you like seafood, you're sure to love our Mussels with Tomato-Wine Broth. Mussels, just like shrimp, cook quickly which means that that you can get this delicious entrée on the table in no time flat. Heat oil in large saucepan on medium heat. Add onions, peppers and garlic; cook 5 min., stirring frequently. Stir in tomato juice and wine; bring to boil, stirring occasionally. Discard any mussels with cracked or broken shells. Add remaining mussels to boiling tomato juice mixture; stir. Cover; simmer on medium-low heat 5 min. or until mussel shells open. Remove and discard any unopened shells. Rinse mussels under cold running water, pulling off the beards that are attached at the bottoms of the shells.